Interested in opening a business in Hoboken? Alternatively, you are always welcome to stop by the City Zoning Office for assistance. In the case where the use is not permitted in the zone, the business owner may apply for a “use variance” from the Zoning Board of Adjustment. Be aware that this process may take several months. If so, architectural drawings will be necessary. A good architect is your best resource for local construction code requirements and can assist you in the approval and permitting process. Some site improvements may require Planning or Zoning Board approval. If no Board review is necessary, the business owner needs to apply with the Zoning Office for a zoning permit for the proposed use. Turn-around time for a zoning permit is usually 1-3 days. Please note that there are fees associated with zoning permits and board reviews. Each case is unique, so the fees may vary. A full fee schedule can be found on the City’s website. Signage - A permit is required prior to erecting, installing, painting, altering, or relocating any sign. This is part of the zoning permit process. Historic Preservation - Much of the City’s Central Business District (CBD) is also in the City’s Historic District. Any business located in the CBD that wishes to install a sign or alter the front façade of their site must obtain approval from the Historic Preservation Commission (HPC) prior to obtaining a zoning permit. After a final zoning inspection, visit the Construction Code Office to apply for a Certificate of Occupancy (CO). If no remodeling or construction is required, business owners may apply for a Certificate of Continued Occupancy (CCO). All building inspections, required licenses, and other inspections must be obtained before the issuance of a CO or CCO; see Step 3 for more information. Please note that there are fees associated with CO and CCO applications and other functions related to licensing, renovation, construction. Additionally, each case is unique, so the permit needs and associated fees vary and are to be determined on a case by case basis. Please note that the City’s Health Department requires all restaurants and retail food businesses to be licensed. Many types of businesses are also required to go through plan review with the Health Department, in addition to any Building Department reviews and inspections. Hoboken can be a tough place to find a parking space, but the City provides several parking options for local businesses. For a comprehensive overview of the options listed below and additional details, please visit the Department of Transportation and Parking. Business owners and persons employed in Hoboken may apply for one of two business parking permit options at the Hoboken Parking Utility (101 1st Street) or on their online portal. Park & Work Daily Debit: the City provides discount garage parking for employees of local businesses. Park-and-Shop Customer Validation Coupons can be purchased by business owners at the Hoboken Parking Utility during regular business hours at 1/2 the face value. This system works just like the validation machines, except you don’t need to worry about billing invoices being sent to your business by the HPU. Multi-Space Meters: the new Pay & Display meter system on Washington Street and surrounding areas provides more parking per block than single space meters and reduces down-time to service more customers. Businesses are responsible for cleaning the sidewalks in front of their establishments. Walks must be swept and/or washed daily. Snow and ice must be cleared from the sidewalk within 6 hours after each storm. No refuse, recycling, or other waste generated by a business shall be placed or stored on any public street or sidewalk. Waste for removal may be placed curbside 2 hours prior to scheduled pick up. Merchandise displays are permitted in front of retail stores from which the goods originate. Displays are limited to a projection of 6 feet or 1/3 of the sidewalk, whichever is less. Audio speakers are not permitted on the exterior of a commercial establishment. Noise originating from a commercial establishment shall not be audible at a distance of 25 feet after 10:00 p.m.
Idling of vehicles is limited to 3 minutes. Delivery vehicle drivers should be made aware of this new statewide regulation. Business alarms must be registered with the City of Hoboken Police Department: 201-420-2100. 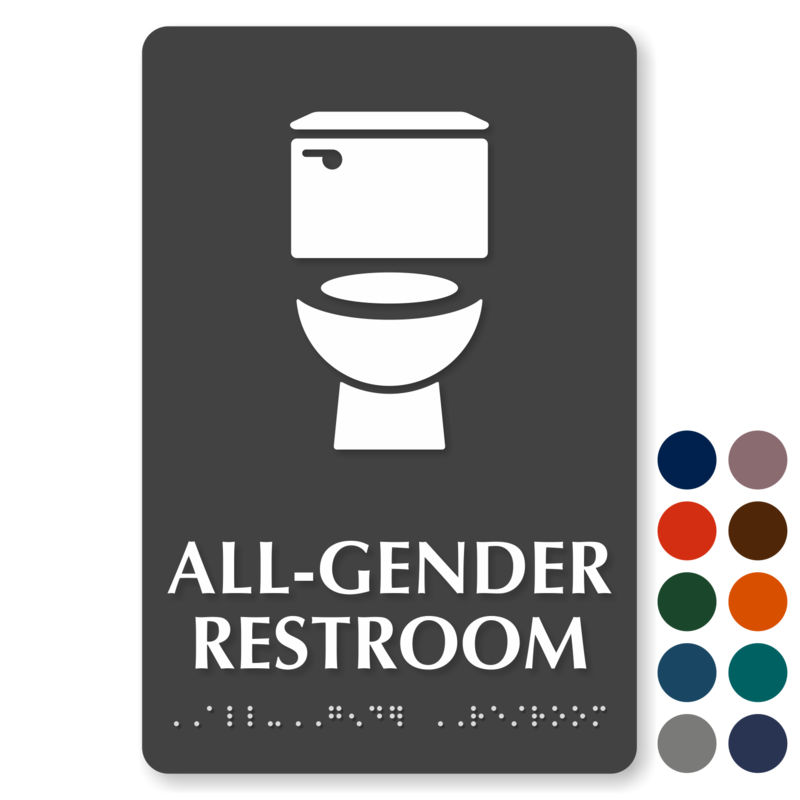 As of July, 2018, all single-occupancy restrooms in the City of Hoboken must be classified as gender-neutral or all-gender. Any restroom intended for one person to use at any given time, which an individual can lock from the inside during use, is considered single-occupancy. If a restroom has a toilet and a urinal, but they are not separated by a stall, the restroom locks, and it is meant to be used by one person at a time, it is considered single-occupancy. Click here and here for examples of appropriate restroom signs. Avoid signs like this, as they exclude non-binary individuals.